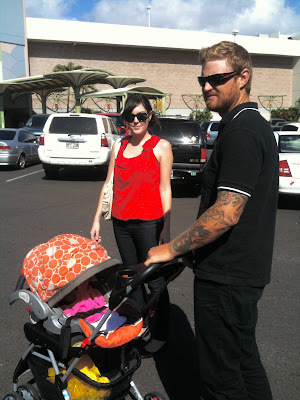 Yesterday we had another family outing to do some errands and hit up the mall. We decided to use the stroller instead of the Moby Wrap this time and I'm happy to report that it was a success! Ro was a complete dream baby and slept the entire time and Mama Bird bought a new cocktail dress for a friend's upcoming wedding. Afterward we headed home for a glass of wine and movie night. We watched Elf because I like to jump right into Christmas mode after Halloween. Don't get me wrong, I loooove me some Thanksgiving (food), but I never decorate for that holiday so I usually already have all my Christmas decor up. We're going to get our tree today! Woot woot! Its great to hear of another mama that decorates early! Thanksgiving is my favorite holiday, but I am so excited for christmas that we put our tree on saturday, lol. Oh I always go to the mall with Alyson when I just need to get out of the house and she normally sleeps the entire time! Saturday she was a little fussy but that's because David kept bugging her and trying to take pictures of her when all she wanted was the shade up (to reduce the light) and to nap lol. We actually might head to the mall again today because I have a Macy's gift card and someone outgrew her newborn clothes lol. I'm a new follower. :) Congrats on your little girl. I'm 30 weeks pregnant with our first...a boy. Really excited. Jamie: thank you thank you and thank you love!!!! Yay for outings! I love your top! out of curiosity..are you getting a real tree? if so..where..especially this early? I'd love to have one this soon on the island. Edith: No we usually get a fake tree.. a white tree actually! You don't even look like you had a baby!!! And your little girl is such a little doll! we need to go and get a tree and I so want to decorate but Corey's birthday is in a few weeks so we need to celebrate that before we start thinking about Christmas. You three are such an adorable little family! I bet tons of people ooo'd and awe'd at her! Whoa! A tree already? I love Christmas too. Maybe I'll watch Elf tonight... my poor hubby will think I'm crazy.